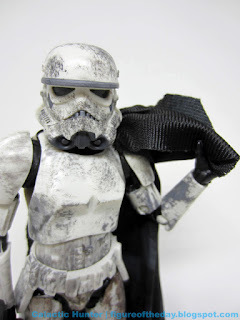 Commentary: I admire Hasbro being smart about reusing molds. 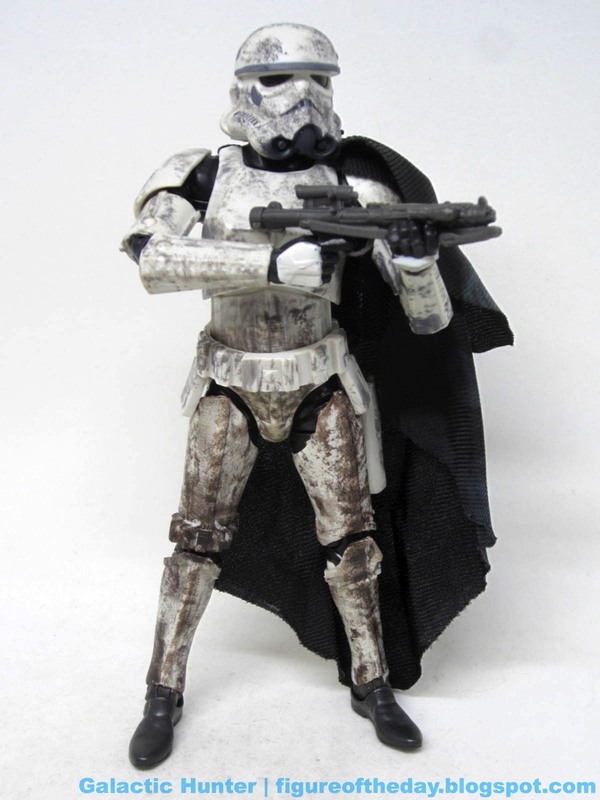 This Stormtrooper (Mimban) brings back the same mold we've had for red Stormtroopers, regular Stormtroopers, disguised Stormtroopers, and even black Stormtroopers. 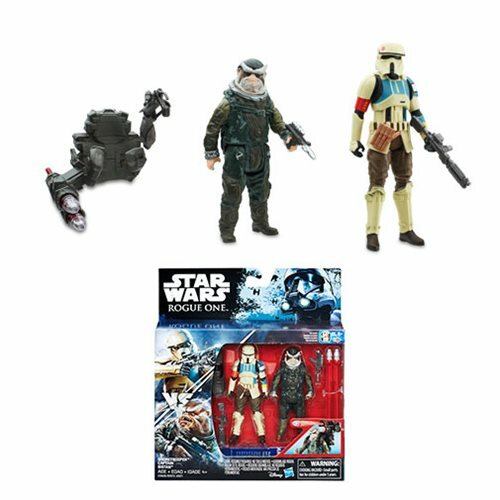 We get a new helmet, a cape that is also kind of a poncho with a hood, some dirt paint, and a new blaster. It's what it should be - a smart redeco with a few new parts to make it different and exciting. 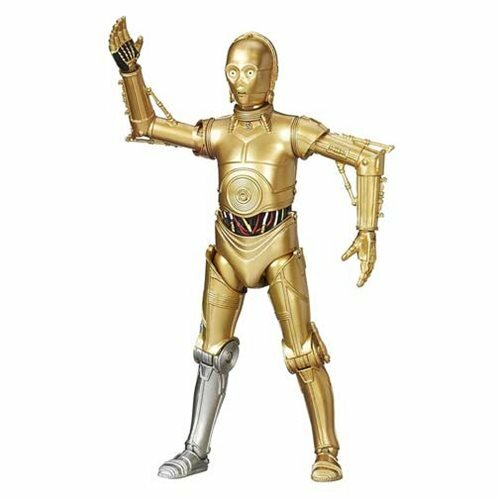 Articulation is what you've seen before - double knees, double elbows, bend-and-swivel wrists, and enough to make this a good trooper to stock up on if the opportunity presented itself. 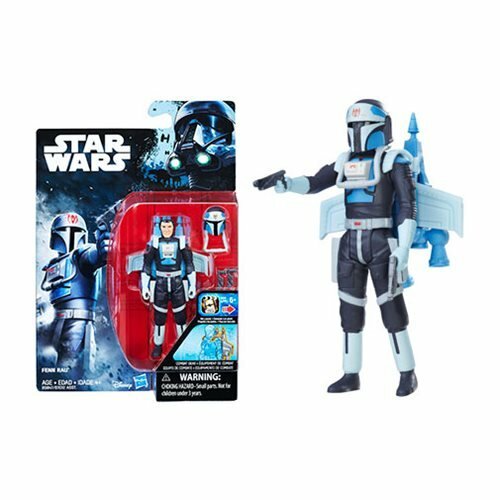 The figure has no problems gripping the blaster, and there's even a holster - not painted black for some reason - in case you want it. The revised helmet has the extra forehead protection, and I like the dirty mud pattern with extra glop on the shoes. While every helmet detail may not be painted in, it's impressive. The dirt hides the missing painted lines in a few spots quite nicely, and the mud is a cooler paint operation anyway. I like the cape, even if the hood on this quasi-poncho doesn't quite rest as I would prefer it. It hangs there and it looks cool. This is good enough for me. While nobody truly needs more Stormtroopers - particularly when we're lacking in figures from this specific sequence - I'll never say no to a cool armored figure done well. Get it if you see it, you probably won't. Collector's Notes: I got mine from Walmart. The box eschews red spot color in favor of a glossy grey.